The assertion that the lost War was the cause of the German collapse is a lie! No, this military collapse was itself the consequence closet clutter, which even in peacetime, plagued the German nation. 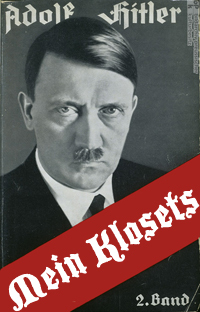 The diminution of the Germanic instinct for closet organization had for many years begun to undermine the national foundation, and especially the Will to Storage, of the people and the Reich. It is idle to argue which races were the original representatives of human culture and hence the real founders of the concept of uncluttered closetry. All culture, art, science and technology that we see before us today – and especially well-organized closets – are almost exclusively the creative product of the Aryan. He is the Prometheus of mankind from whose bright forehead the divine spark of organizational genius has sprung, to be rewarded with properly matched and drawered socks, trousers ordered by season, a belt rack, and mastery over the other beings of this earth. Whoever really and seriously desires that the idea of the People’s State should triumph must realize that this triumph can be assured only through a militant restructuring of our closets – its strength grounded only on the granite firmness of an impregnable and firmly coherent closet-organization programme, preferably directed by a homosexual. A nation that understands the profound essence of its struggle and feels itself to be the purest embodiment of organizational savvy, will with almost mathematical certainty some day emerge victorious. The Motherland shall inevitably win her rightful position on this earth if she is led and her closets dutifully purged and organized according to the same principles. One People! One Land! Color-coded Containers!